I have this little shelf unit attached to the end of my cabinets in the kitchen and it’s a good place to highlight some seasonal decor. A cherry theme seemed like a festive idea for the summer. 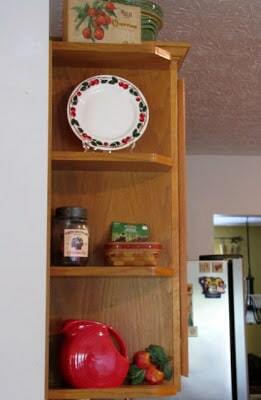 On the bottom shelf my red Fiestaware juice pitcher is placed next to my chalkware cherries. 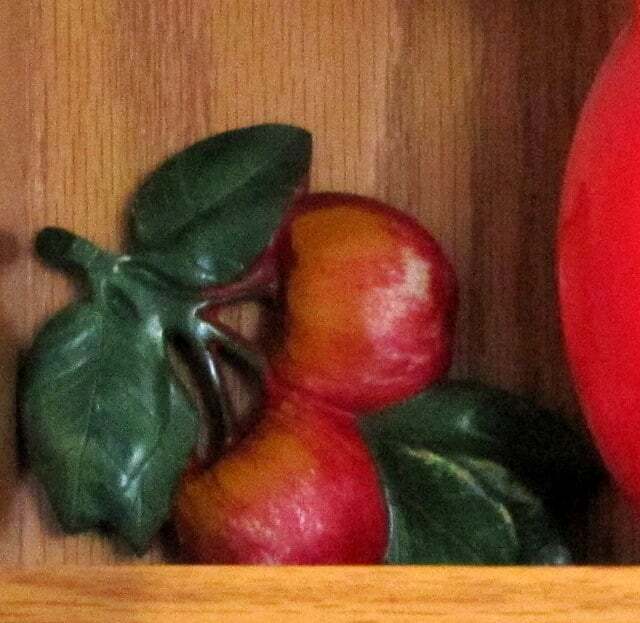 I would think they originally had other fruit to go with them, but this is the only piece of it that I ever saw at my Mom’s house. I think the grapes and bananas must have been broken long ago. Ok, now that I’m looking at them on my computer, I am not sure they really are cherries. Maybe they are supposed to be apples. Have I been mistaken all these years? Is this display all based upon a lie? Let’s all just assume they are cherries for now so I can sleep tonight! On the next shelf I have a faux vintage cherry jar that I filled with faux cherries. Next up is my cherry salad plate. I can’t read the maker’s mark on the back of the plate, but I’m pretty sure it’s vintage. It has a 1940’s look to it. And on the top is my chocolate covered cherry box that I bought at a garage sale from a lady that had TONS of old boxes, tins, ephemera and advertising stuff. I always regret not having bought more of her stuff. Hope you enjoyed my cheerful cherry tour (or should we say cherry and apple tour)! You will have to participate more on red day. You have a great feature for the occasion. I have not been doing Rednesday in awhile, but I like to participate in different ones. For today they are cherries; they are red and …they hold memories which is a wonderful thing. Oh what lovely cherry appley red fun. Love that jug btw beeootiful colour! 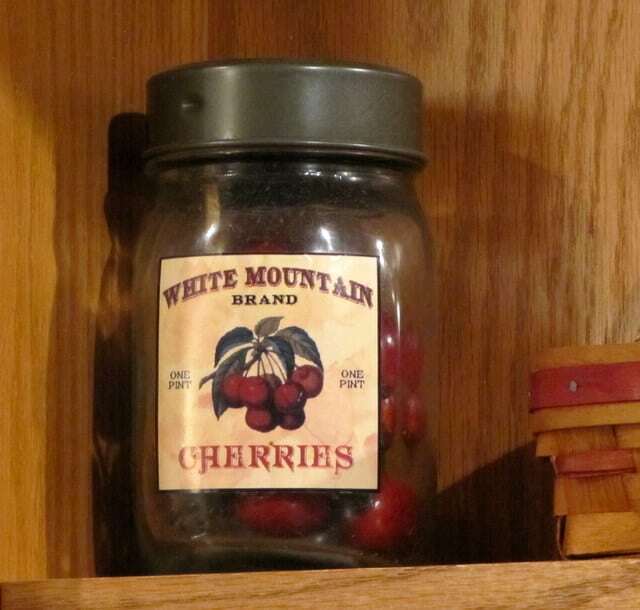 Faux cherries in said jar…..do we see a thread running thru this post Cherry Patrol! LOL….Oh Paleeese get a grip I think they look like cherries too. Glad you came by Sue’s so we could meet! Love the Cherry…er…cheery post. Cute things, I love the box too! 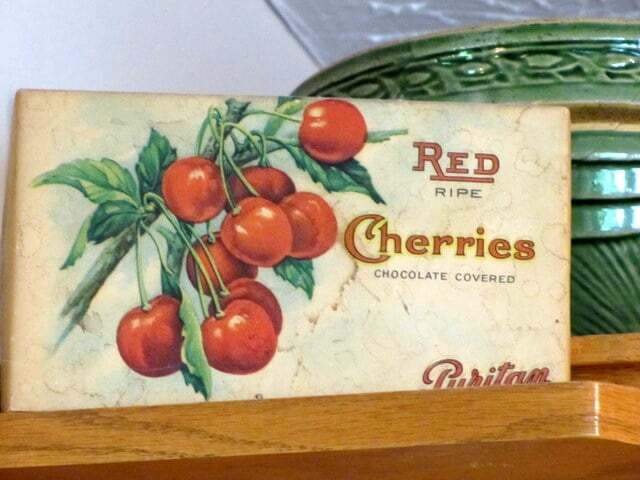 Love the graphics on that chocolate covered cherries box!! I don’t know…looks like apples to me but we’ll let you slide since your chocolate covered cherries box is so Awesome! Thanks for sharing your cherries with us on Rednesday. Really fun and pretty red! I love the red Fiesta pitcher!! Love the cherry theme. When I was pregnant with my daughter I must confess I kept the little boxes of chocolate covered cherries in my purse which explains why I was so big! Thanks for visiting my blog. You would love the phlox because they come back every year and they multiply so you could share with others. I love your pitcher and ….your box! FAB! Love your vintage cherry jar, Have a sweet day! Such a fun summer theme. 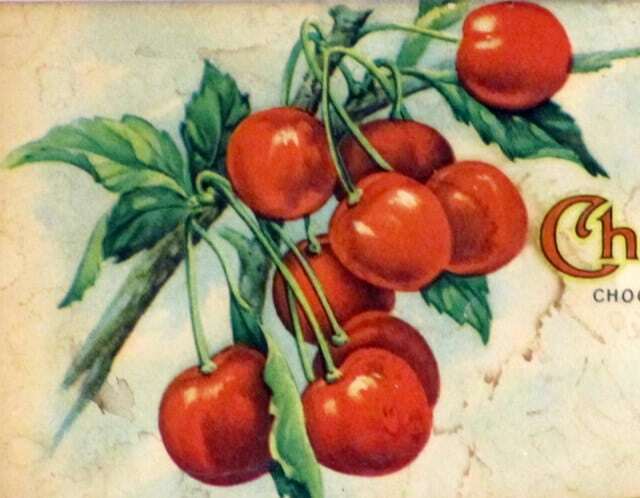 I do not have any cherry items in my house but think I should buy some to punch up the color in my kitchen. 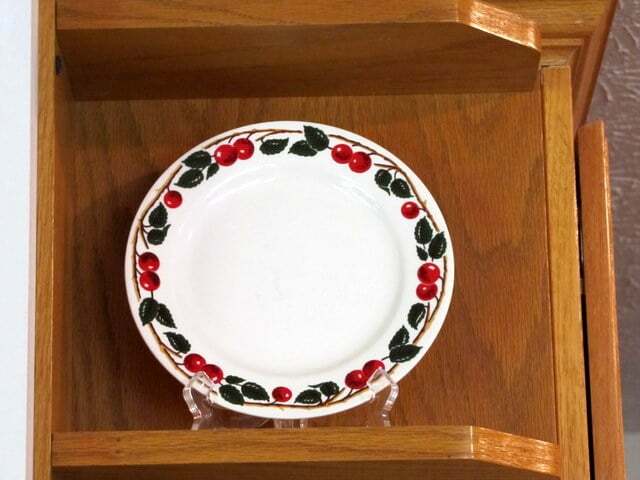 I have been eating cherries all week and want to bake a cherry pie…lip smacking good! Hi Pam! Everything looks wonderful! Cherries, apples . . . how about “chapples”? LOL! That reminds me of a chalkware plaque that I need to hang up! Love that plate, too – does it have a name or markings on it? I love cherries too! 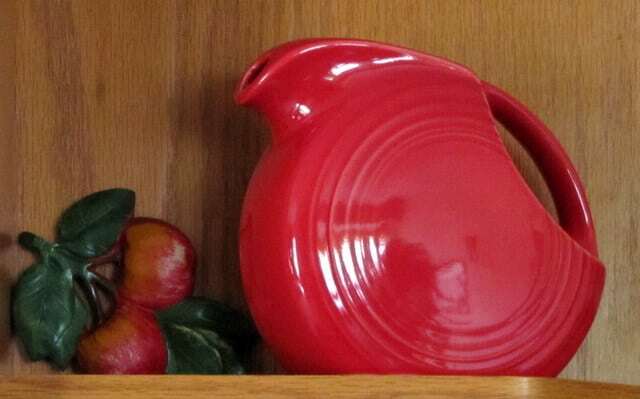 I’ve had my eyes on getting a red fiesta pitcher for quite awhile. One of these days, one wil find me (hopefully on clearance or at a thrift store). I really like the vintage box. 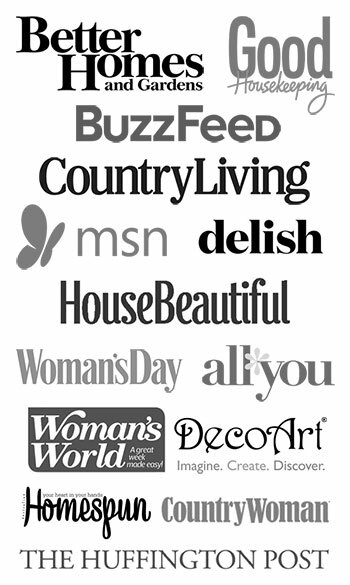 Oh, your blog looks wonderful! 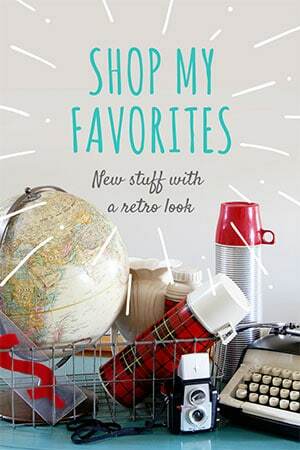 I adore knick knack shelves, what a wonderful place to have one and so much fun to change it up. I adore you cherry box! Recently I went to a yard sale where a woman had a ton of wonderful paper ephemera and I have been kicking myself for not having bought more. Regrets regrets. WAH! Pam, you are so funny: “Is this display based on a lie?” LOL! And I DO like all of your cherry things.